This past weekend I had the opportunity to go to Dylan’s Candy Bar in New York City. 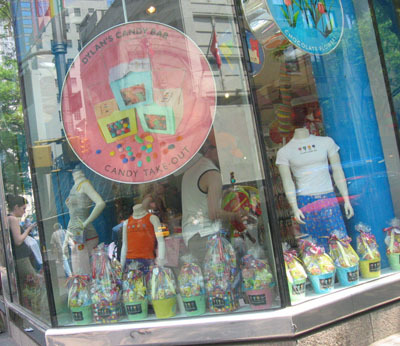 For those of you who are unaware, Dylan’s Candy Bar is run by Ralph Lauren’s daughter Dylan Lauren and the store is considered the closest thing to Willy Wonka in the real life. The store features all different types of candy and is meant to appeal to any candy love, especially the beautiful young New York socialite. I’ve heard so much about this place and was really excited to finally get to see it with my own eyes. The outside blends right into the Manhattan street where it sits on the corner of 60th and Third Avenue. Its large windows only hint of what is inside and is decorated with headless models wearing the logo tee shirts (creepy?) and gift baskets bursting with colorful candy. The first thing that I noticed when I stepped inside is the smell. Oh, what a wonderful smell! Made of up all things sweet, it’s chocolatey and buttery, welcoming you inside. My attention was then turned to the giant area in front of me devoted to bin candy. Gummis, taffy, lollipops, chocolates of all shapes, colors and sizes; both familiar and not, where there to represent themselves and to tempt you. Tempt is a good way of putting it too, because the price on these was whopping $9.99 a pound! Boxes of candy were strategically placed amongst the bins (I remember seeing 100 Grand, Sugar Daddy, and Big Hunk getting the best placement) reminding you there is still more to the store. Working toward the back, I found that Dylan’s has a ice cream bar with a giant floor to ceiling picture display of their offerings. If that wasn’t enough, there was also a small display case off to the side filled with cupcakes and other treats in case ice cream wasn’t you thing. From there I noticed the stair well that led into the lower level of the store. It was almost dizzying to walk down it, as it was lit up so that you could see all the bits of candy that were decorated into the steps. I was following the candy brick road down into the candy city, as so to speak. This level had so much more to offer than the first floor. 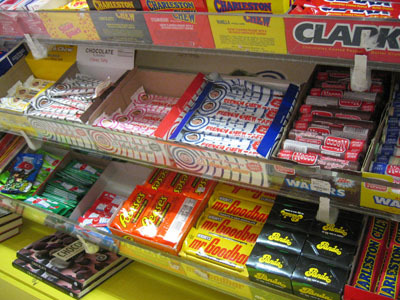 There’s a whole corner devoted to retro candy with Idaho Spud, Skybar, Clark Bar, and Charleston Chew among many others, all waiting to waken some long forgotten childhood memory. On the other side there were the self-dispensing bins of Jelly Belly’s Jelly Beans and the M&M Colorworks bins as well. Along the large back wall there was a huge display of PEZ candies and dispensers for sale. I don’t think I’ve ever seen so many all in one place. The other half of the wall was devoted to Dylan’s own line of Belgian chocolates. 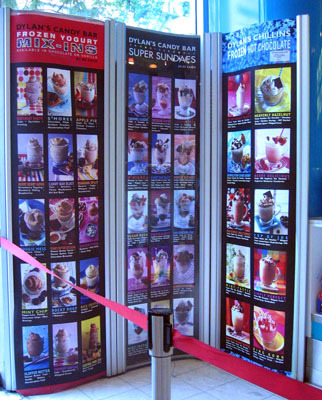 There was a whole display dedicated to Celebrity candies. It was interesting to read though the names and see what their favorite candy was, even though I found I really didn’t care that much. 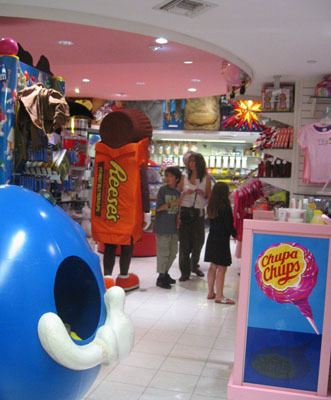 To makes things seem even more surreal, The Reese’s Peanut Butter Cup character mascot (yes, the one from Hershey Park) was walking around! It was really fascinating to see a lot of the candy products that we mention here at Candy Addict. They had the Jelly Belly lollipops, the Jelly Belly Cologne as well as the Big Tips Candy Collection. I was surprised by how much “retail” stuff there was in the store. Clothes with the Dylan’s candy logo on everything from baby bibs, t-shirts, pajamas and track suits. It wasn’t just clothing either; candy pillows, plush toys, perfumes, body washes, makeup, lip-gloss….the list goes on. A lot of this store is about is the image it’s selling, as well as the candy. 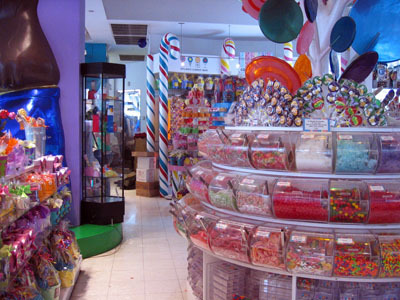 Which is what I really think gets to the essence of Dylan’s Candy Bar: go for the eye candy, but save your money for a place where you can get more sugar for you buck. Peep These Pics – Pronto! Hahaha yeah i know! That place sounds AMAZING! I have two local candy shops and they sell all bin candies for about $3.99 a 1/4 pound ($15.96 a pound) and $2.49 a 1/4 pound ($11.96 a pound). Dylanâ€™s Candy Bar is cheaper then both at $9.99 a pound!! So much for my local non-name candy peddlers. yeaa am goin there soon cant wait ! Hey!!! I’m Dylan Laurens husband!! I went to Dylan’s candy bar before. Everything you said is 100% true! 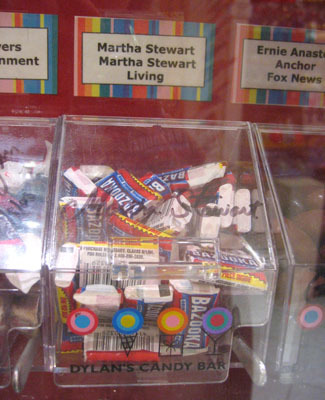 I love how they had their celebrities’ fave candy all lined up! So cute! 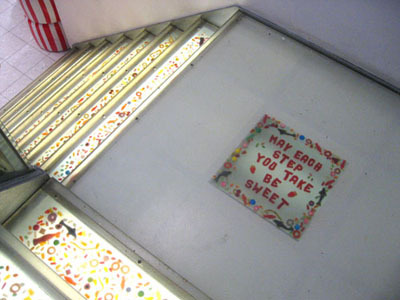 The stairs are so cute with their candy inside it! Saw your shop on Oprah looks like a fantastic place, my son would love it. s reall ycute and sad we don’t have anyhting like this !!!! i just went last week it was so much fun and i got dots earbuds i love the famous wall i saw taylor swift on there it is so much fun.